Bulgogi (buul-GOH-ghee) literally means “fire meat” in Korean, but in America it’s often referred to as Korean BBQ. Call it what you want, but this new favorite from Mathews HQ definitely belongs in your big game recipe deck. Soak your thinly sliced elk up in this sweet and savory marinade for as long as you can bear to wait and skewer it up for easy grilling. We prefer to eat it straight off the skewers, but if you’re aiming to impress with a full meal, you can always serve them with iceberg leaves and white rice for Bull-gogi lettuce cups. Prep the meat: If thawed, place your steaks in the freezer for 20-30 min for easy slicing. If frozen, slice meat before it thaws completely. This will allow you to easily slice as thinly as you can cutting against the grain. Whisk all the marinade ingredients together in a large bowl. 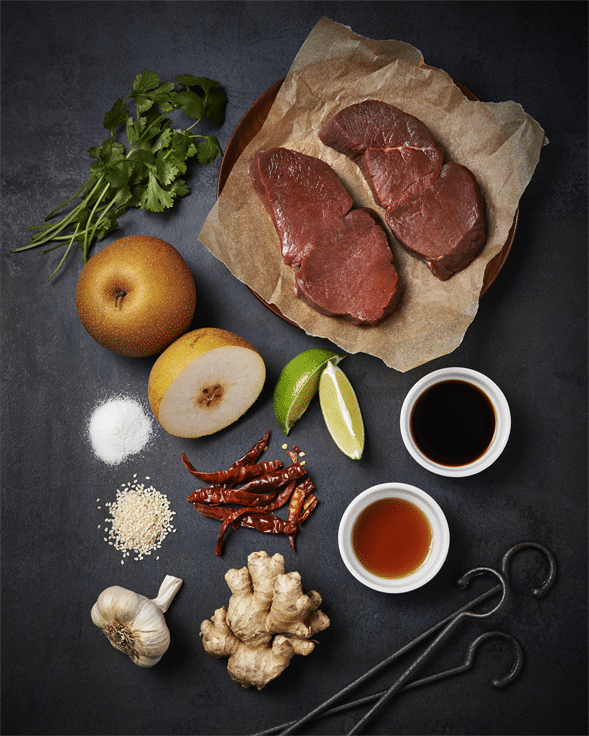 When the sugar has dissolved, add the sliced elk, scallion and onion slices to the bowl and toss until the meat is fully coated. Cover and refrigerate for at least 1 hour or up to overnight. Take meat out of the refrigerator 30 minutes before you plan to cook it to take the chill off. Heat and oil a grill, grill pan or cast-iron griddle. Place the skewers directly on the grill in a single layer. Cook on one side for 1-2 minutes and then flip and cook the other side, 1-2 minutes longer or until you get good grill marks and crispy edges. Remove skewers from the grill when they are fully cooked and garnish with sesame seeds, cilantro and lime. For the lettuce wraps, serve with leaves of iceberg lettuce and white rice.